LIVE STREAMING: HOW DOES IT WORK? This short post is aimed to help our clients who have little to no experience with video broadcasting to understand what the live streaming process looks like. A live event – a conference, panel discussion, webinar or webcast – held on location or in a live streaming studio streamed to a target audience. An on-location event is usually captured with a three camera set up – for a close-up shot, a wider shot of all presenters together and shots of the audience. Specific audio recording equipment is required to have a clear, high-quality sound output, usually provided by the local AV team. In our studio, we're using three camera angles - one dedicated to the host presenter, the second is roaming between the guests accordingly, and the third one is a wide-shot, showing all the contributors in the panel discussion at the same time. As part of our studio package - we provide the high quality sound experience by one of our sound technicians. To create a professional multi-camera streaming set-up, we use a video mixer. 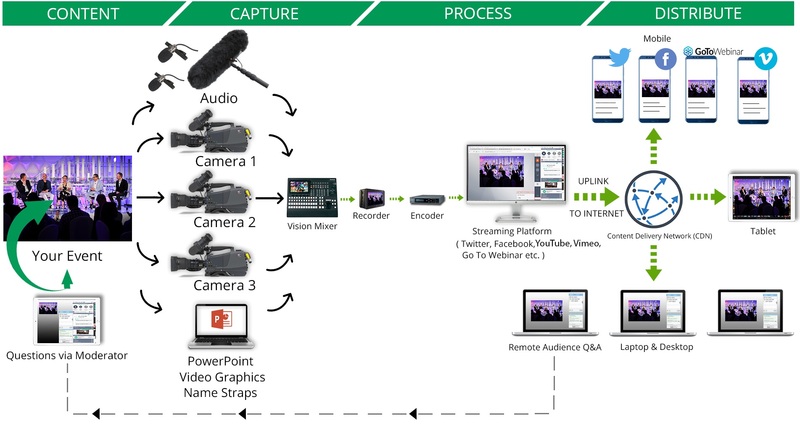 Its purpose is to switch between the cameras or any other video sources like a computer screen, Powerpoint presentations, pre-recorded videos and to overlay images and titles (name straps) on your broadcast. The video mixer helps to create a visually interesting and dynamic show. An encoder routes the live footage (from the mixer) and is then converted into a streaming format ready to be broadcast via a video streaming platform. 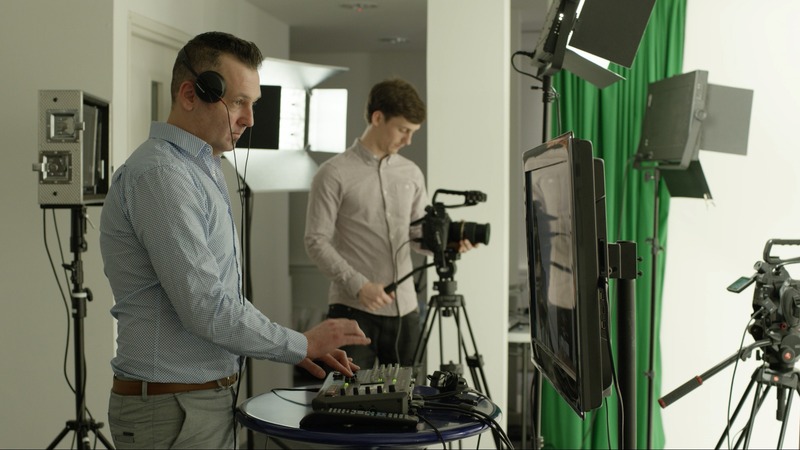 From the webcasting platform, the live stream content is processed via the CDN (Content Delivery Network) to different devices – laptops, desktops, tablets or mobiles. Through most platforms, you can poll your audience and have a live Q&A session with the moderator fielding these questions and the panel answering them.